They have a powerful influence. But unrealistic, unreachable goals can produce unethical behavior. We’ve seen this movie over and over in the public sector. Teachers and administrators in several public school systems have been caught correcting students answers on high-stakes tests, as a reaction to the enormous pressure they felt to improve student performance. In one of the worst cases, in 2011, an investigation found that 178 teachers and administrators in Atlanta’s schools had corrected student responses on standardized tests. Several of them went to jail. The same kind of unethical behavior occurred on a wide scale at the U.S. Department of Veterans Affairs, again because of high-stakes goals that were virtually impossible to meet. Supervisors directed front-line staff to cook the books to make it appear that all vets received a medical appointment within 14 days of requesting it — the department’s all-important performance measure. The huge number of troops who had been injured in the wars in Iraq and Afghanistan made it impossible for the VA to treat all vets so quickly. But there was intense pressure to do so, and that led hundreds of department staff and supervisors to falsify appointment records. In 1995, an excellent public-sector leader named Bill Leighty was named director of the Virginia Retirement System. He took over a deeply troubled agency. It was in turmoil because of a major scandal, support in the state legislature was almost nonexistent, and employee morale was in the basement. This agency had some of the most rigid silos I’ve ever seen. Leighty knew he had to make major changes quickly to raise morale and performance. By the end of this exercise, the agency staff had been relieved of rules and performance measures that wasted their time and, even worse, led to behaviors that lowered performance and customer service. And Leighty actively involved the employees whenever they developed new measures to ensure that those measures were meaningful and had no unintended consequences. 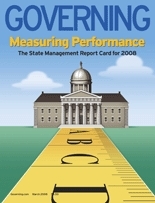 • Which of these measures provide staff with operational information that’s truly useful? • Which of them simply waste people’s time? • Which ones promote collaboration and information sharing among staff? • Which lead to unanticipated consequences that are harmful to customers? • And perhaps most important, are the measures achievable? Do they focus on factors that staff can actually control? Albert Einstein once said that “not everything that counts is countable, and not everything that’s countable counts.” Do your organization’s performance measures count?